The Graveyard of Giants is revealed in all of its destroyed glory. A live-stream was held last night to show off Star Wars: Battlefront’s first content update, namely the Battle of Jakku which includes two new maps and the new Turning Point mode for fans. Check out gameplay from one of those maps – Graveyard of Giants – in the video below. Set several years before the events of Star Wars Episode VII: The Force Awakens, the map seen below will also be available for vehicle-based modes like Fighter Squadron. Turning Point will arguably be one of the cooler new modes as it acts like Battlefront’s version of Rush. Players must capture key points defended by the Imperials, pushing them further back until the latter must make a last stand. The Battle of Jakku DLC is available free to all players on December 8th. 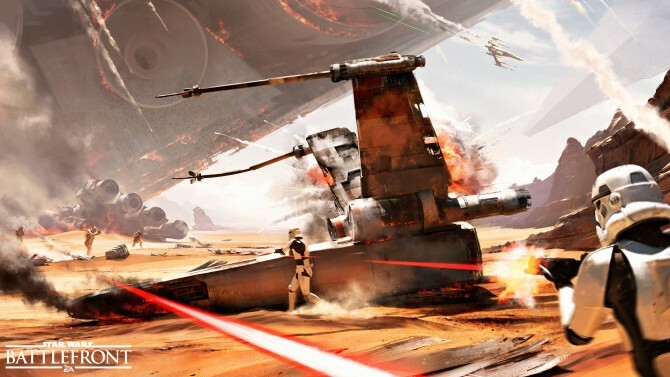 Those who pre-ordered Star Wars: Battlefront should have access to it from December 1st onwards so keep an eye out. Though Battlefront will have four paid expansions starting from early 2016, EA has assured fans that more free content like Star Cards and maps are also on the way.